Need to get that onion smell off your hands? Wash your hands with ketchup, and it will remove the smell. This easy to make recipe is take off of our well known french toasts. However, if you are looking for something a little different, definitely try out these french toast rounds. In a bowl, whisk together eggs, milk, salt, vanilla, and cinnamon until well blended. Heat a lightly oiled griddle to medium/hot. Dip both sides of the muffin halves into the egg mixture. Place slices on heated griddle. Cook until golden brown on both sides. Both my kids and I liked this (hubby missed it due to being at the Chicago Bears game). 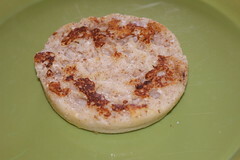 Let me know if you have a great french toast recipe I should try on our next bag of English muffins.